While it may seem like Christmas has only just wrapped up, it is never too early to start thinking about your corporate Christmas party for this year. After all, particularly if you have a large number of employees, it requires a lot of organization and preparation and is better to get done and dusted as early as possible. This is why we have put together five of our top shared Christmas parties in London. Why not take your staff on a festive immersive theatrical production set in the medieval days. It takes place in Ivory Vaults, an exclusive location within the atmospheric, historic vaulted cellars of Ivory House in St Katherine Docks and offers free-flowing wine and ale with dinner and a themed journey through the lives of each noble house and its occupants. Don’t fancy dinner? Why not have a medieval style lunch instead? For what will o’fish’ally be a night to remember, book in at the London Aquarium Sealife Centre. This shared Christmas party will include a drinks reception, walk through the shark tunnel and three-course meal under the ever-changing display of shoaling fish and sharks. A DJ is on hand to round off the evening with a whole host of festive tunes to get everyone in the party spirit. Let’s face it, everyone has dreamt of the day they can walk the red carpet, so why not let your employees do just this with a shared Christmas party at Madame Tussauds? Enjoy a drinks reception while posing for pictures with your favourite A-list celebrities, before dining in the World Stage ballroom where you can enjoy a three-course meal under the watchful eye of the Royal Family! After dinner, you can whirl around the dance floor with a DJ and final dance with the stars. 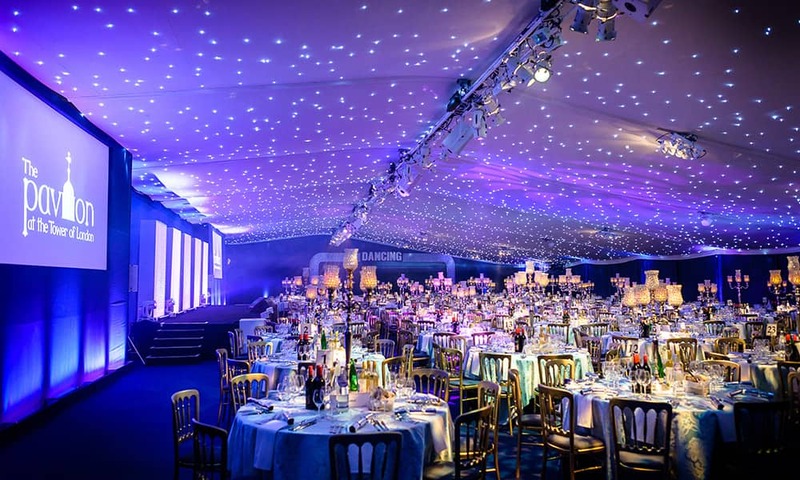 For a Christmas party oozing glitz, glamour and a real wow factor, look no further than the Pavilion at the Tower of London. Ideal for shared Christmas parties in London, it is situated in the shadow of one of the capital’s most iconic landmarks and in a convenient location to get to. It is a decadent setting with sparkling wine, a live band and three course dinner. After dinner, a secret dancefloor will appear, ideal for getting everyone in the festive spirit. With its high ceilings, decadent lighting and large space, London Old Billingsgate is an ideal destination for shared Christmas parties in London. Start the evening with a drinks reception under towering pillars and elegant architecture before sitting down to a delicious three course dinner with the atmosphere of 1,000 guests. Wind the night up by listening (and dancing to) the live music and entertainment. Next articleJust Announced! Another new P&O Cruise ship will join the fleet in 2022!